Director of the ANLP team in the LaRI laboratory (Laboratory of Research in Computer Sciences), since 2010. Tutoring coordinator in the Faculty of Science (April 2010). Cofounder of the master in ” Computer Science Engineering”, 2010-2017. Cofounder of the master in ” Research in Computer science”, 2010-2013. Coordinator of the SMA chain license (License of Mathematics Sciences), (2007-2011). Member of the council of the Mathematics and Computer Sciences department , (2007-2009). Cofounder oof the ANLP team in the LaRI laboratory (Laboratory of Research in Computer Sciences), October 2006. Member of the LaRI (Laboratory of Researches in Computer Sciences), since October 2005. 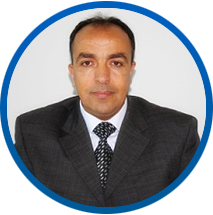 Member of the Scientific Faculty Council of Oujda (2002-2005). Member of Numerical Analysis and Computer Sciences Laboratory (1999-2005). Cofounder of the UFR Doctorate in “Approximation, Computer Sciences and Signal Analysis”, 2005-2009.